Brighton is this skier's pick for the best value snowsports vacation in Utah, where ski hills are many, close to Salt Lake City and super competitive. Salt Lake City, Utah sits in the epicenter of one of the richest collections of ski mountains in the United States. Within 45 minutes’ of baggage claim, you’ll reach 10 mountains worthy of that annual family ski vacation. If value is your guide and goal, you’ll find several mountains favored by locals that offer excellent family skiing experiences for less than the most famous ones. I know it’s hard to compete with the most luxurious ski resorts this side of Gstaad but their prices are at the top end of the industry. Deer Valley, Snowbasin, Snowbird, the Canyons and, at a more modest level, Alta, occupy this haute tier by offering great skiing and luxe service and facilities — they really do, I’ve been there. But a family looking to save will have to accept superior skiing with more modest accommodations or base themselves in Salt Lake City and commute to a variety of mountains. This is not a huge compromise, as Salt Lake offers excellent restaurants and decent value hotels. The Utah Jazz play basketball right downtown and a nearby multiplex provides aprÃ¨s-ski family entertainment, all ideal for kids of any age. You can also save on a rental car as regular bus service takes skiers from downtown hotels to the resorts at nominal cost — also a nice way, I found, to give teens some independence while feeling green. So where are the locals’ favorites? On the southeast corner of Salt Lake City two canyons rise up from the valley into the stunning Wasatch Mountains. Little Cottonwood Canyon has bragging rights to the two legendary mountains of Alta and Snowbird. Big Cottonwood hosts two smaller, quieter resorts best known to locals— Brighton and Solitude. 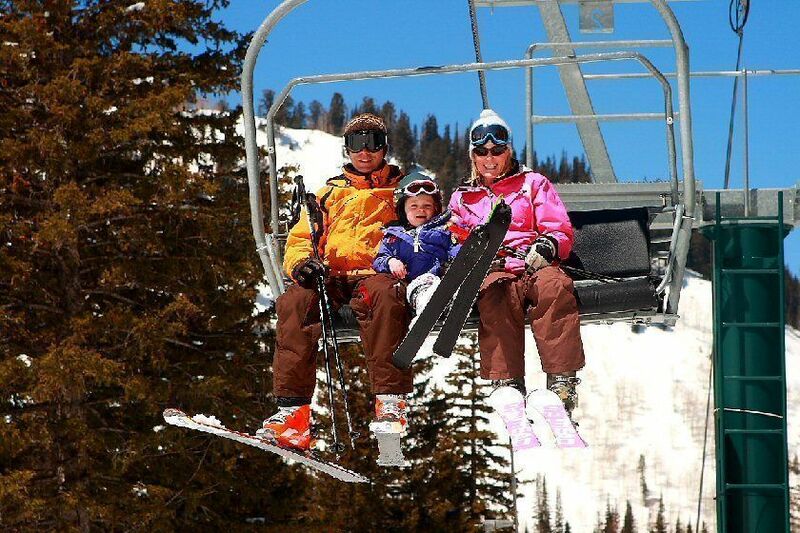 For top value family skiing at an individual resort, head to the upper end of Big Cottonwood. Families will find that Brighton, located at 12601 E. Big Cottonwood Canyon Road Brighton UT 84121, is hard to beat, particularly if your kids are under age 8, since they get to ski or ride free. Night skiing is big at Brighton, as well, with 200 acres of slopes open until 9pm, a nice (cheap) way to entertain and tire out the kids. In other ways, Brighton offers some of the best values along with fine slopes and excellent children’s programs. It has the cheapest lift tickets ($62/day in 2010-11), with kids under 8 skiing or boarding free with a paying adult. There are two full-service base lodges serving three peaks ranging over 1,050 skiable acres. This means lots of good beginner runs, and a variety of demanding terrain for more advanced skiers and boarders. Snowboarders are welcome to ride three terrain parks. Next to the main base lodge, Molly Green’s is an excellent casual restaurant, supplementing the basic base lodge fare nearby. It’s a very comfortable, modest-scale mountain with plenty of variety for all skill levels. 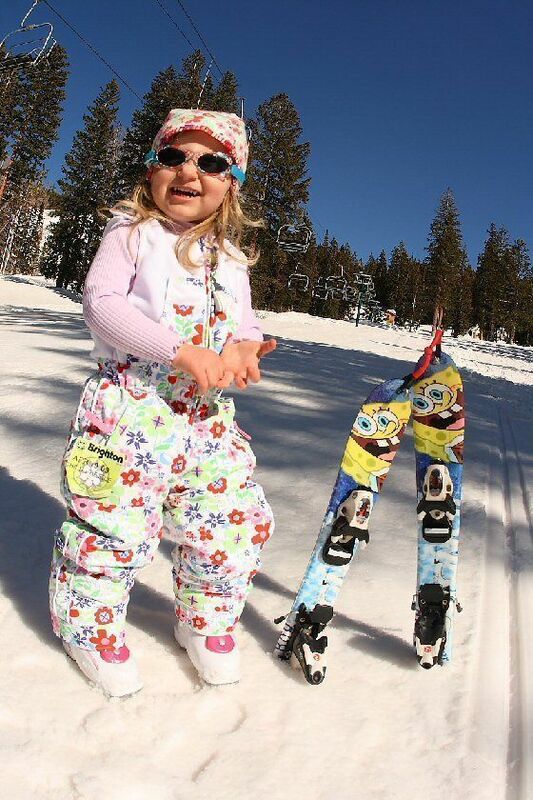 The well-run ski school is highly regarded and offers board or ski instruction beginning at age 4 up to 12. A full-day kids program runs $104, a value compared to some of the more expensive resorts, which have full-day kid ski school prices upwards of $175. Note that the snowboard program starts at age 4, which is uncommonly young in the industry and sure to delight some toddlers. Adult novices are welcomed too, with steep discounts on learning lessons, lift tickets and gear rentals, with special promotions thoughout the season. For the winter of 2010-2011, Brighton Ski Resort will open a childcare facility for its mountain guests, employees, and locals. Located at the beginning of the Brighton loop, the Utah state-licensed childcare facility will operate seasonally from 8:30am to 4:30pm, while the Brighton Resort is open (approximately mid-November to mid-April). 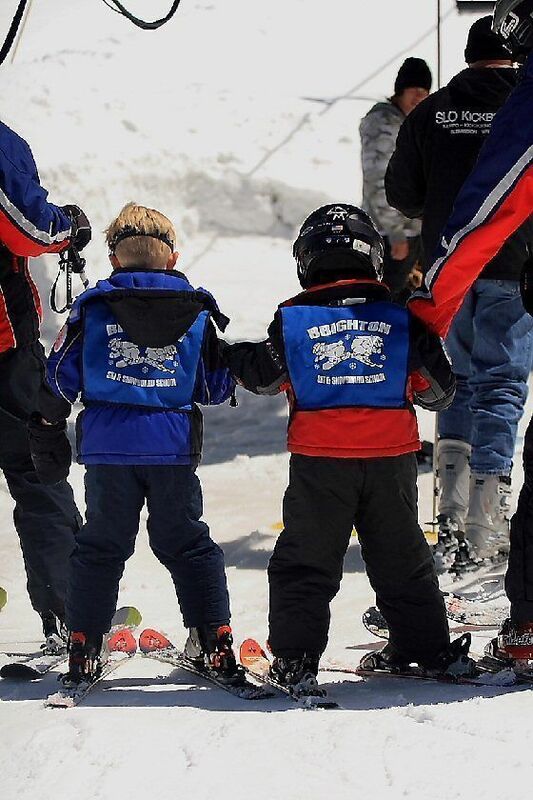 Parents of little ones will be delighted to hear that Brighton Child Care (801/209-9480) will work closely with the Brighton Ski School and provide ski school lesson drop off and pick up. The facility offers half-day and full-day options for children 6 weeks old and up, providing a supervised space for older children who are not interested in learning snowsports. Some families will fly into Salt Lake and make this Utah visit their one big, blowout family ski holiday. If you don’t want to be limited to only one mountain, yet need to sample all of the resorts in both Cottonwood Canyons at a reasonable cost, the best value is the Ski Salt Lake Super Pass. With this pass you get lift tickets to any of the four Cottonwood Canyon resorts plus daily bus or light rail service to and from, and 25% off equipment rentals at their designated vendor. The public UTA (Utah Transit Authority) buses serve all four resorts from downtown Salt Lake City. If your kids are over age 7, the Super Pass rate is is the best option for a family skiing any one resort, as well. Add in lodging at one of their participating hotels, and the fourth night is free for both lift tickets and lodging. It’s quite a good deal. (Note: For the fourth-night-free option, you must book by December 15 but this may get extended.) Be advised that Alta does not allow snowboards. The downside? Lodging is limited at Brighton, as are dining choices. The Brighton Lodge (800/873 5512 x120), Brighton, UT 84121 offers 20 basic rooms without TV or phone but with ski in/ski out accessibility; however, there is a comfy common room with big-screen TV. Mount Majestic Properties (888/236 0667), Brighton, UT 84121 has family style condos within walking distance, some with ski in/ski out convenience. The eating options are thin in both cases but a big plus: kids 10 and under stay free with adults. The most economical option for the budget-starved family is the lodging in Salt Lake City. Brighton is only a 40-minute drive from downtown; the UTA’s regular bus service will get you there in about an hour, as well. There are several chain hotels offering good value in the downtown area where there is a lively nightlife with a wide variety of restaurants. The liveliest night life centers around South 300 Street (a.k.a. “Broadway”) where much of the nightlife and eating life is to be found. 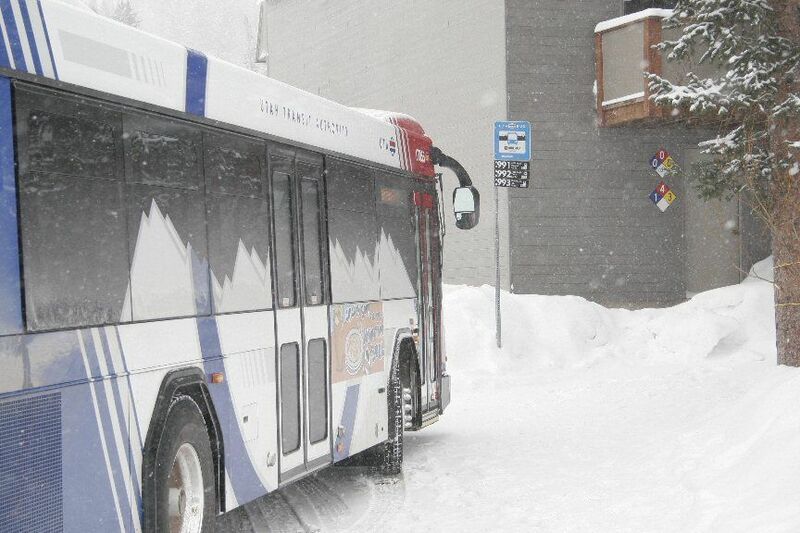 The UTA (888/RIDE UTA) bus service stops at 10 hotels in downtown and takes you to the parking lot at the bottom of Big Cottonwood, where you can connect to the shuttle to Brighton, or continue on the same bus to Snowbird and Alta in Little Canyonwood. Among the Salt Lake City hotels with UTA bus service are these family-friendly picks. The Hyatt Place Salt Lake City (888/492-8847) has much to offer families. It’s very close to the Gateway Mall, the Utah Planetarium, the Utah Children’s Museum if you’re traveling with little ones, and the Energy Solutions Arena for Jazz basketball. Wi-fi and continental breakfast are free. The Embassy Suites and Hampton Inn Downtown are always good family choices, with both offering large rooms (in the case of Embassy Suites, rooms with a living area with pullout sofabed), free breakfast and convenient locations. Also centrally located in Salt Lake City with bus service access, the Grand America and Little America hotels offer a more upscale option. Other downtown choices include branches of all the major chains — Hilton Salt Lake City Center, Crystal Inn Downtown, Super 8 Motel, Hilton Garden Inn, Sheraton Salt Lake City, Radisson Hotel Salt Lake City, Sheraton Salt Lake City, Shilo In Hotel— Downtown Salt Lake City, but the former have the edge when it comes to value and number of guests per room. An easy way to book your lodging with or without the Super Pass, and to learn more about the area, is the Salt Lake Tourism Office website.